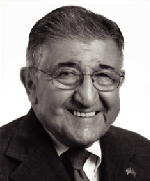 A. Robert Abboud was born in Boston in 1929 to a Lebanese immigrant mother and a 1st generation American father of Lebanese descent, he attended Harvard and then joined the U.S. Marines during the Korean War. He was involved in extensive combat operations with the 1st Marine Division in battles at: 3 Fingers, Hill 137, Bunker Hill, Nevada City, Reno, Vegas Carson, the Hook and York. In July 1952, he was wounded but was patched up and stayed on the line with his platoon. He later received the Bronze Star For Valor and the Purple Heart. After returning to the USA in May 1953, he attended Harvard Law School, graduating in 1956. In 1958 he received an MBA from Harvard Business School where he was a Baker Scholar. After Harvard, he joined the 1st Chicago Bank and became Chairman and CEO of the 1st Chicago in 1975. In 1980, he became president of Occidental Petroleum. He was Independent Lead Director of Ivanhoe Energy Inc. since May 17, 2006. He has also served on numerous Boards of Directors, many of them as Audit Committee Chairman, including Standard Oil Company, Cities Service Co., The Federal Reserve Bank of Chicago, International Monetary Market, Inland Steel, Field Enterprises, Alberto Culver Company, Hartmarx Corp., and ICN Pharmaceutical. Today, Mr. Abboud is the President at A. Robert Abboud and Company.